Two action packed holiday Western stories by award-winning author Livia J. Washburn. Hired gun Lucas Hallam has been outnumbered plenty of times, but when he comes upon a necktie party for a young boy accused of cattle rustling, he has to step into danger once more—even with the odds stacked against him. No one should hang on Christmas Eve. When the nearby cattle stampede, it looks like things can’t get any worse. But the weather is turning deadly, and if they don’t get the cattle to shelter—as well as themselves—everything will be lost. Can Hallam protect them from the coming BLUE NORTHER? Mistaken for a “skookum”, Buffalo Newcomb is shot by a young boy, Tom Villard, as he stops by a creek to fish. When he comes to in a small cabin, Buffalo is grateful to realize that the boy’s mother, Ella, has removed the bullet and he has a safe place to recover. 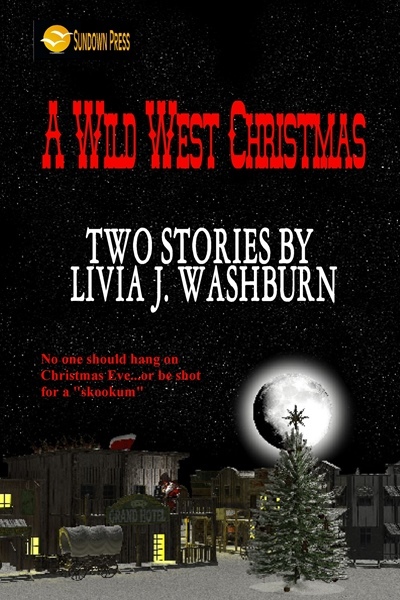 It’s Christmas Eve, and A CREATURE WAS STIRRING—Buffalo can only hope he’s strong enough to keep it from destroying the woman who has shown him only kindness. The bullet came out of nowhere and hit Buffalo Newcomb as he straightened from the spot where he'd been kneeling beside a fast-flowing creek. He'd been trying to reach into the water and grab one of the trout that swam by, tantalizing him. For such a big man, his hands were incredibly fast. The impact was like a hammer blow on the back of his left shoulder. It made him stumble forward, and since he was a little off-balance to start with, he had no chance to catch himself. He toppled forward into the creek with a huge splash. "I got him! I got me a skookum!"